The deck of a house is generally a wooden platform built above the ground and connected to the main building. It is generally enclosed by a railing for safety. Access may be from the house through doors and from the ground via a stairway. 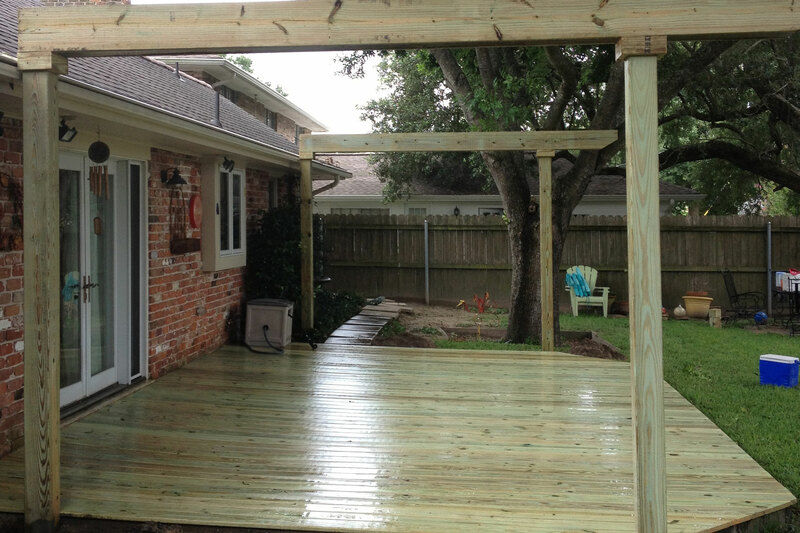 Residential decks can be constructed over steep areas or rough ground that is otherwise unusable. Decks can also be covered by a canopy or pergola to control sunlight. Make sure you choose a quality wood deck builder. A pergola, arbor or arbour is a garden feature forming a shaded walkway, passageway or sitting area of vertical posts or pillars that usually support cross-beams and a sturdy open lattice, often upon which woody vines are trained. As a type of gazebo, it may also be an extension of a building, or serve as protection for an open terrace or a link between pavilions. Pergolas may link pavilions or extend from a building’s door to an open garden feature such as an isolated terrace or pool. Freestanding pergolas, those not attached to a home or other structure, provide a sitting area that allows for breeze and light sun, but offers protection from the harsh glare of direct sunlight. Pergolas also give climbing plants a structure on which to grow.